The patient was 64 years old when referred to our office in October of 1993. Her general dentist had noted an osseous mass on her routine panoramic x-ray. The patient was asymptomatic regarding her temporomandibular joints. Medical history revealed a well developed white 64 y.o. female. The patient had no known drug allergies. Medications included Synthroid, Vasotec, Noluodex. Prior surgical procedures included an appendectomy, tonsillectomy, mastectomy, and thyroidectomy. The patient had a full mouth extraction in 1978. A positive history of trauma was reported by the patient. At the age of 10 the patient fell in a hay loft striking her chin on a friends head. 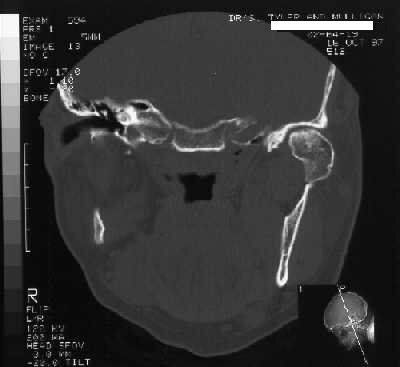 The patient experienced severe pain and limitation of jaw opening. No treatment was pursued. 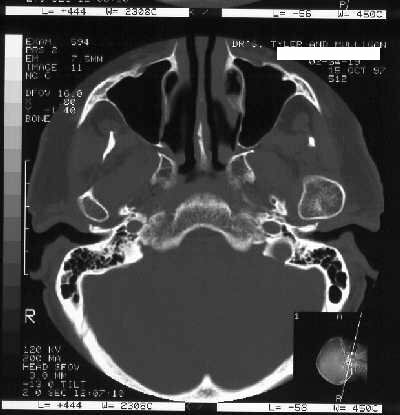 A neurology headache workup in 1990 revealed a mandibular condyle lesion on CAT scan examination. Oral examination revealed an edentulous maxilla and mandible with sever mandibular alveolar ridge atrophy. A Class III denture malocclusion was present. Mild facial asymmetry was noted with slight fullness over the left preauricular area. During maximum opening, palpation over the left TMJ revealed a more prominent condylar head than on the right. 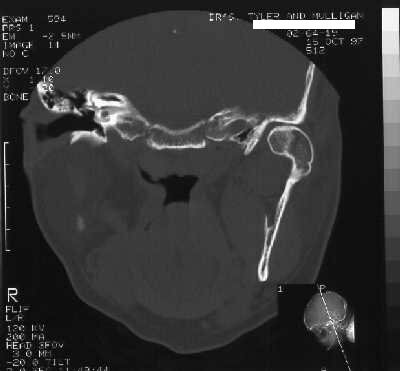 Panoramic radiographic and CAT scan examinations revealed a radiopaque lobulated globular condylar mass involving the left TMJ. Mild restriction of left condylar translation and sclerosis were noted on TMJ hypocycloidal tomography. Laboratory data was within normal limits. 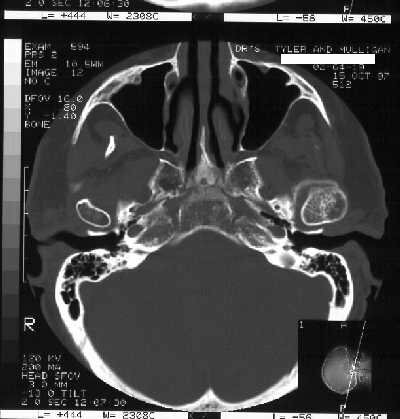 Serial CAT scans in 1990, 1994, and 1997 show no significant change in the expansile lesion. Patient was given treatment options of surgery or observation. Since patient was asymptomatic she elected observation.